Rivers State Governor, Nyesom Ezenwo Wike has alleged that the Central Bank of Nigeria (CBN) Governor and the Chairman of Economic and Financial Crimes Commission (EFCC) have directed Managing Directors of Banks to deny Rivers State cash during the weeks of 2019 Election. 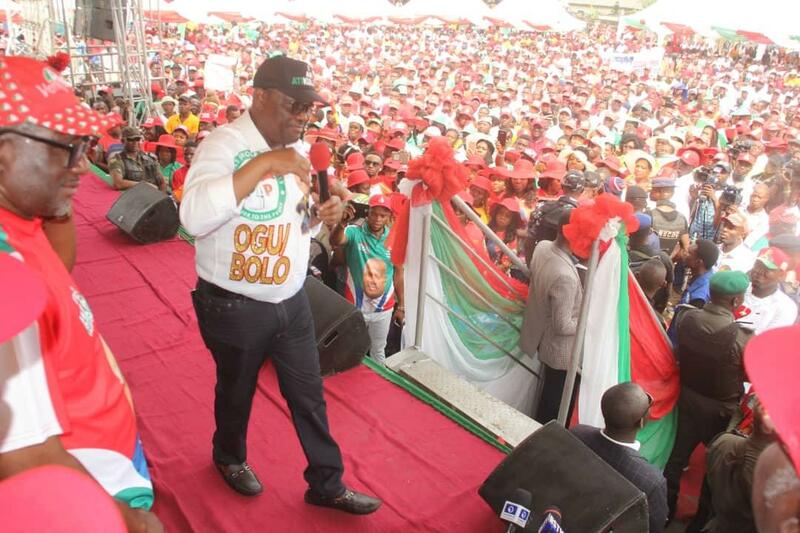 Rivers State PDP Chairman, Bro Felix Obuah thanked the Ogu/Bolo people wholeheartedly supporting Rivers State Governor and other PDP candidates. He presented the PDP Candidate for Rivers East Senatorial District , Senator George Sekibo, PDP Candidate for Okrika/Ogu/Bolo Federal Constituency, Bright Gogo and PDP Candidate for Ogu/Bolo State Constituency, Evans Bipi to the people and asked them to vote for them. Former Commissioner and Rivers State Abuja Liaison Officer, Hon Vincent Nemieboka said that the people will deliver the area to the PDP because of the achievements of Governor Wike. Chairman of PDP in Ogu/Bolo Local Government Area , Engr Arnold Davids said that the Local Government Area is the heartbeat of PDP in the state . He assured that all PDP candidates will win their respective elections.